Fans in Mexico can look forward to a gripping season finale of the Porsche Mobil 1 Supercup: Three competitors will fight for the championship title at rounds nine and ten of the international one-make cup contested from 26-28 October. Michael Ammermüller (D/BWT Lechner Racing), Nick Yelloly (GB/Fach Auto Tech) and Porsche Junior Thomas Preining (A/BWT Lechner Racing) could all take home the crown. Forty points are up for grabs at the doubleheader in Mexico City, which runs as support to the Formula 1 race. Ammermüller (119 points) currently leads the standings five points ahead of Yelloly. Preining ranks third with 105 points. Twenty-eight drivers from 15 countries will tackle the two races on the Autódromo Hermanos Rodríguez in their 485 hp Porsche 911 GT3 Cup racers. Series leader Ammermüller is the only driver with the decision firmly in his own hands. The German driver’s formula for success is relatively straightforward: if the 32-year-old crosses the finish line in front of his hottest rivals, he will be champion. The ex-Formula 1 test driver is no stranger to such situations. Ammermüller travelled to last year’s season finale as the hunted points’ leader, with second-placed Dennis Olsen hot on his heels chasing overall victory. Ammermüller, however, prevailed and took home the trophy. So far this season, the Lechner pilot has notched up just one victory at the opening round in Barcelona. However, with five podium results under his belt, Ammermüller has finished in the top three more than any other competitor. “I managed to extend my points lead at Monza, and that gives me confidence. It’ll be a close fight, but I’m looking forward to both races,” says Ammermüller. Yelloly, however, is determined to achieve his first title in GT racing. The driver from Solihull in the UK is Ammermüller’s closest rival and has won at the legendary city circuit of Monaco and at Hockenheim. In the last two years, Yelloly has gained experience in the Porsche Carrera Cup Deutschland, where he secured the vice-championship last season. Prior to this, the 27-year-old raced single-seaters and still works as a simulator driver for the Formula 1 team Force India. “I love the pressure. But I only know the Autódromo Hermanos Rodríguez from the time I contested the GP2 and GP3 series,” explains Yelloly. Porsche Junior Preining travels to Mexico with a healthy dose of self-assurance. 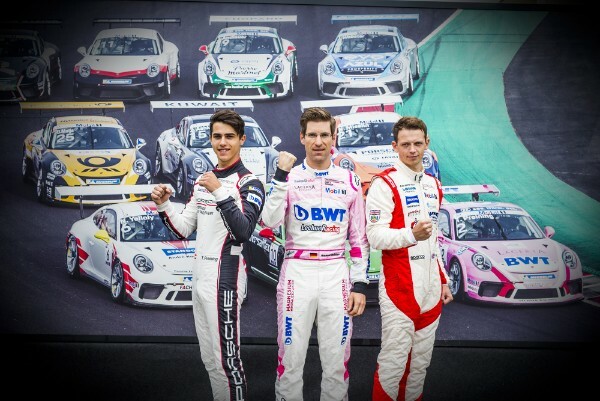 The youngster from Linz, Austria, was recently crowned champion of the 2018 Porsche Carrera Cup Deutschland. And in the Porsche Mobil 1 Supercup, Preining is underlining his talent. In addition to his home race in Spielberg, he scored victory on the Hungaroring (Hungary), on the Belgium Circuit de Spa-Francorchamps and on Italy’s Autodromo Nazionale Monza. “I’m in high form and my goal is very clear: to win both races – I can’t influence the rest anyway,” says Preining. The two drivers Mattia Drudi (I/Dinamic Motorsport) and Porsche Junior Julien Andlauer (F/martinet by ALMERAS) have an outside chance of claiming the title. With 93 and 87 points respectively, the pair would have to secure top spots in both races and hope that the leading trio come home empty-handed from both rounds. The titles in all other classifications will also be decided at the final race weekend in Mexico: The rookie class is led by Frenchman Florian Latorre (martinet by ALMERAS) with 71 points. Roar Lindland (Lechner Racing Middle East) ranks first in the Pro-Am class. The Norwegian has 138 points to his credit. Leading the team classification is the BWT Lechner Racing squad with 224 points. First in the Nations League is France (166 points). Overseas races are part of Porsche Mobil 1 Supercup tradition. The first time the one-make series raced far from European soil was in 1999 at the Australian Grand Prix in Melbourne. This tradition was upheld with championship rounds held in Indianapolis (USA), Sakhir (Bahrain), Abu Dhabi (UAE) and Austin (USA). After 2017, this is the second time in a row that the Supercup has celebrated its finale in Mexico City.